I thought I'd just do a quick little post today as I've had a killer headache that I can't seem to shift. 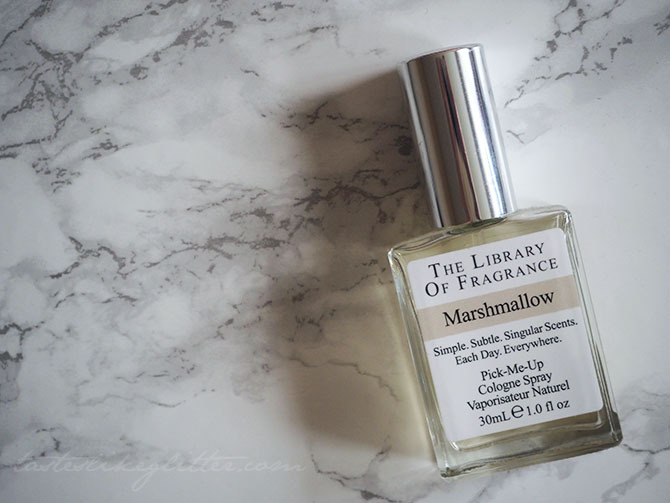 Marshmallow is a light, subtle fragrance as you would expect. It mixes vanilla and hints of sugary sweetness without being too overpowering or sickly. It also seems like there's just a touch of honey at the end of the scent, which makes sense since marshmallows were originally made with honey. Since it's such a light fragrance it isn't as long lasting on the skin as I would like but it's delicious in spite of that. I find it perfect for those days when you don't want or need a heavy fragrance. It's not the most obscure or original fragrance from the brand but it's something I can see a lot of people falling for.